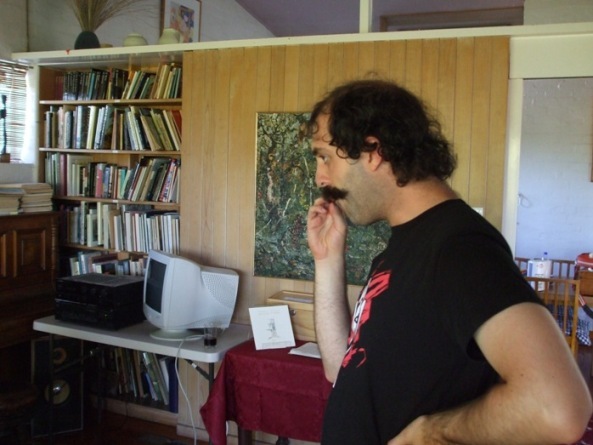 Monday 5 January 20009 was the first day of Bohemian’s Manning Clark House residency. Over the next four weeks Jackal, Mick, Muttley and myself will be living and working full-time in the former residence of historian Manning Clark, stapling together the component pieces of our new interactive performance Food for the Great Hungers, examining Australia’s history through the framework of Complex Systems science. Muttley in Manning Clark House – literally afraid of nothing. Hungers is an installation performance combining narrative theatre, live trombone / electronica and lo- and hi-fi interactive media to create a simulated re-imagining of Australian history from 1901 to the present. Using an array of purpose-built control devices, the audience will direct the performance and decide the course of 20th century Australian history. Manning Clark House is a national heritage building in the guts of Canberra (Forrest), maintained as it was when Clark worked there writing his six-volume History of Australia in the 1960s and 70s. It’s an extraordinary building, significant Australian cultural landmark, and Boho is one of the first arts collectives (possibly the first performance groups) to be invited to undertake a residency. Apart from live music in the garden, MCH has never been used as a performance space – we are extraordinarily lucky to have access to this resource. And yet, as well as being a scholarly and cultural centre, it’s a house. It’s a domestic residence with a kitchen, a living room and three bedrooms. We’re doing a cross-artform theatre performance – in a house. We can serve tea and scones during the performance. And that’s awesome.